The Salvation Army is dedicated to Doing the Most Good in your community. People often ask why The Salvation Army offers so many different services and programs. The programs and services differ in order to meet the unique needs of the people in the communities we serve. We take a holistic approach to Doing the Most Good where there is the most need without discrimination, whether it be disaster relief, emergency assistance, substance abuse rehabilitation or educational programs for children. The Salvation Army is the largest direct provider of social services to people in need in Illinois, and has been serving our local community for more than 125 years. We make an impact every day in three key areas of critical importance and concern to people across Chicagoland – homelessness, violent crime and education. To learn more about The Salvation Army Metropolitan Division, visit www.salarmymetro.org. To learn more history about The Salvation Army International, visit story.salvationarmy.org. If you find yourself in need, whether that need be practical, recreational, spiritual or emotional, we hope you will seek our assistance. With a presence in nearly every zip code in America, there is a local Salvation Army near you. There are 28 Corps Community Centers within The Salvation Army Metropolitan Division. To find The Salvation Army in your community, type in your zip code in our location search tool here. For information on The Salvation Army's work in other parts of the United States, visit our National website. And visit The Salvation Army International website to learn how we're Doing The Most Good around the world every day. 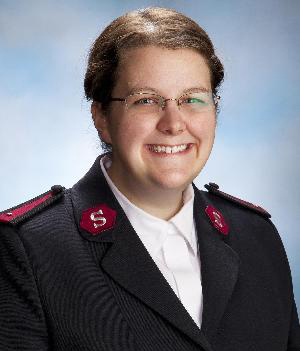 The Salvation Army is led by officers – ordained ministers – who supervise the many programs and services provided in your area. They also serve as administrators, counselors and youth leaders. At the St. Charles (Tri-City) Corps Community Center, Captain Betsy Clark is our leader. She comes with vast experience and knowledge, interacts with the community on a daily basis, and is a primary point of contact for your questions, comments or requests for assistance. Captain Clark is also faith leaders: here to respond to the physical, emotional and spiritual needs in your community. Discover ways to support The Salvation Army on our Ways to Give page. To schedule a free donation pick up please call 1-800-SA-TRUCK (1-800-728-7825). To learn more about our Thrift Stores and donation centers visit satruck.org. To receive mobile alerts from The Salvation Army (Metropolitan Divsion) choose from the options below. Once you have received your invitation, reply Y to activate. Message and Data Rates May Apply. Text STOP to 51555 to stop. Text HELP to 51555 for help. If you are interested in a career within The Salvation Army, visit our Careers website to view current job opportunities. For assistance, please call 630-377-2769. If additional assistance is needed, The Salvation Army Metropolitan Division's Social Services Department can be reached at 773-205-3520 or email us. Someone will contact you within 24 hours, Monday - Friday, 9am - 4pm. Messages received during the weekend will be returned on the first business day. You can also search for services in your community.